The skills/levels must be added to the class in order to manage and update skills in the Staff Portal. Skills assigned to students should be updated in the database. Once you have created your skills/levels you can add them to classes. When a skill/level is added to a class, it (and any subskills) are added to the enrolled students. If a student already has the skill/level on their record it will not be added again. If a skill/level is added to a class, a subskill created after cannot be added to the students in the class. It is best to create a new skill/level and add it to the class. Go to the Class record and select the Skills/Levels tab. Click Add Skill/Level To Class. Select the Skill/Level using the drop down menu or use the search field to locate the skill/level. Enter the Date Training Started. Note: If the skill/level has not been started you can leave this field blank. Enter a Date Due, Date Tested, and Date Attained if applicable. Select which Students you want to add the skill/level to. 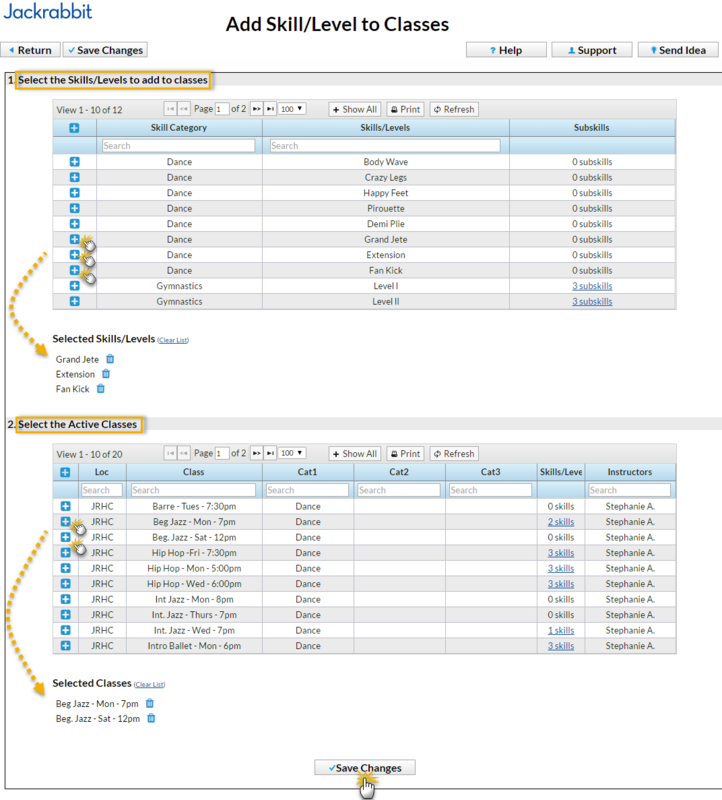 Save & Add Another or Save Changes. Point to Students on the main menu and select Skills/Levels Add to Classes. Use the [+] to Select the Skills/Levels to add to classes. Use the [+] to Select the Active Classes to add the skills/levels to. 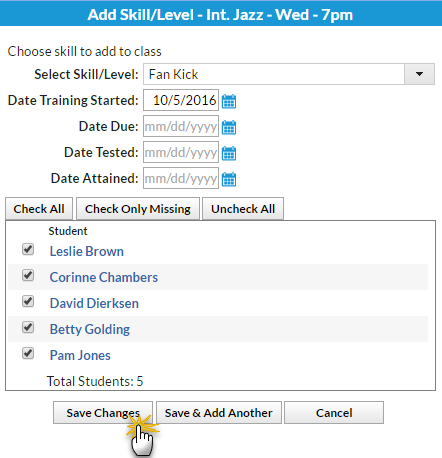 If a student is enrolled into a class after the skills/levels have been added to the class, those skills/levels will be added to the student automatically using their first day in class as the Date Training Started.